Quilting Adventures: A basket case ...! I have laid the machine appliqueing of baskets aside for a bit before I, myself, turn into a basket case! In the meantime, I picked up a BOM I started back in January 2014. 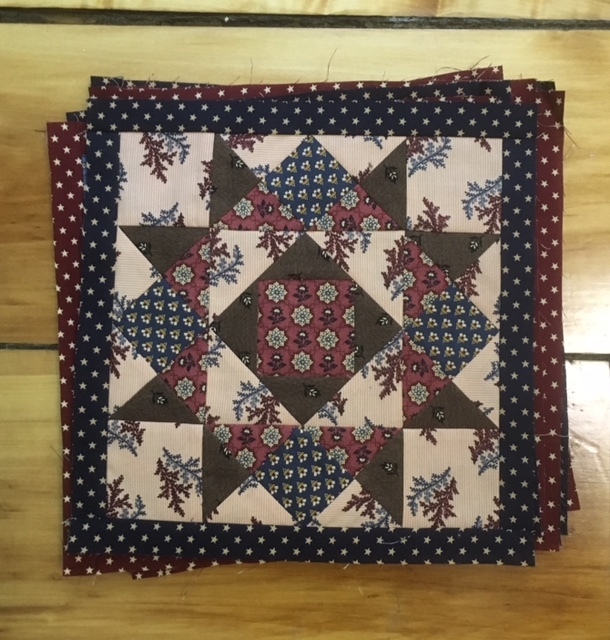 The quilt is called Civil War: Peace and Unity designed by Sarah Maxwell and Dolores Smith; the last in a series of quilts commemorating the 150th anniversary of the civil war. Although I had all the 20 (yea you read right) Court House Step blocks done, I sort of put it away not even planning on completing it. I gave up on this quilt! But, I kept it all in a plastic bin, sort of "in waiting." I even thought of just piecing the court house step blocks into a small quilt top and call it a done deal! 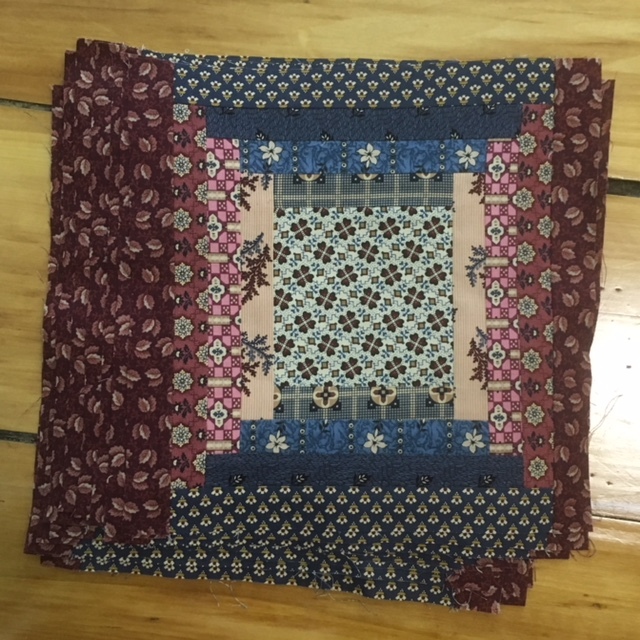 It wasn't until the Shoppe Troll, aka Nancy, completed her quilt and brought it in to show me that I remembered how gorgeous it was. Then, I fell in love with the quilt all over again, vowing to complete the top ... some day! Well, "some day" came ... I pulled it out and started working away on the twelve (12) different blocks. Voila! The pile of blocks! Guess what I'm working on today! Thanks for stopping by little corner in cyberspace! Wishing you a wonderful day! Cheers! I love that quilt, gorgeous fabrics. That is going to be gorgeous. Sometimes we need a little time to fall in love all over again. I don't remember this quilt design but it has a look thus far that I like. 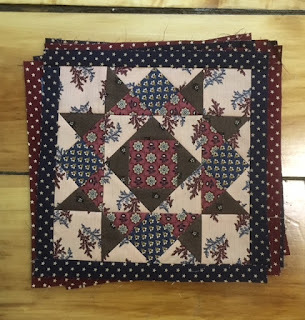 Good that you kept your pieces and parts and remembered how well you liked the quilt design originally. Sometimes I even forget what my pieces and parts go to. I don't always keep the book with the parts nor make myself a note. Sometimes it takes a little inspiration to jump start the UFOs to bring them to closure. Your project looks great. Keep it up!